Here's something I spent hours on making, hope you like it! Hope I can improve my PS skills and make more Comments and feedback is welcomed. nice...............do u mind if i save it as a destop picture???? Of course you can =) Glad you like it! WoWoWoW..."Well Done Well Done Indeed"
i really love that wallpaper. those words are touching especially saying that "your happiness is more important than mine" trully their love is unconditional. Thanks a lot for your effort on it.. It is beautiful.. And the words are meaningful too.. I am gonna use it as a desktop picture... Hope you don't mind.. Some comments: Your PS skills is excellent. The contrast and brightness is just nice for a desktop background. 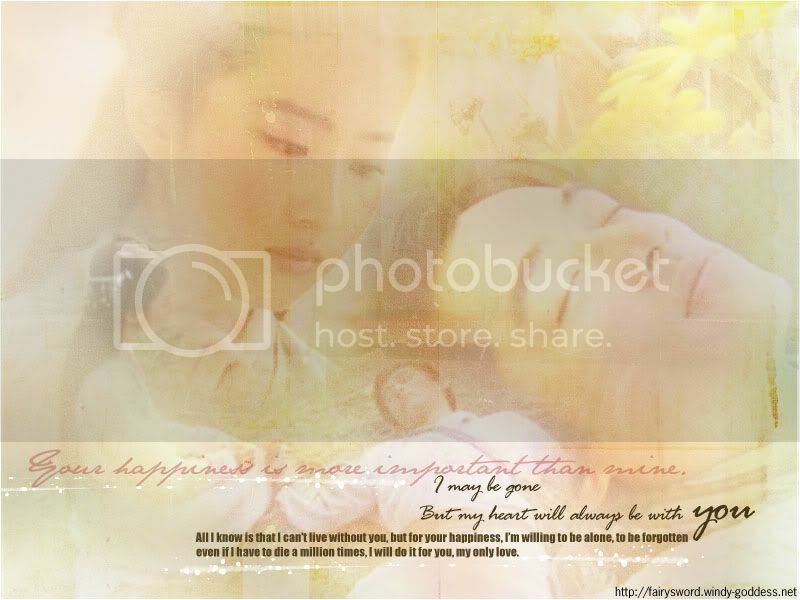 However the image of Xiao Yao and Ling'er in the picture might be a bit too blur. Wow...you have cool PS skills . Like some of the others, hope you don't mind if I use this as my desktop wallpaper .